Connoisseurs of seventies (and early eighties) tele-fright-flicks know that they're a mix of the really rather good (DARK NIGHT OF THE SCARECROW, THE NIGHT STALKER), the legendary (SATAN'S SCHOOL FOR GIRLS, CROWHAVEN FARM, PHANTOM OF HOLLYWOOD) and the daft (CRUISE INTO TERROR, DISASTER ON THE COASTLINER). Steven Spielberg's 1971 classic DUEL (originally an ABC flick of the week later given a theatrical release with some extra footage to bump-up the thrills and the running time) made other menacing-machine-movies inevitable and Universal turned to Theodore Sturgeon's 1944 novella for more of the same. The 1974 TVM is seventy-odd minutes of a (swiftly diminishing) construction crew, having accidentally awakened an ancient alien entity somehow entombed in a half-meriod bit of space rock, being (very) slowly menaced by the mean-spirited machine. It's very silly stuff, completely lacking in menace despite the hardware-of-hate's success in offing the bumbling humans. Not even The Asylum would dare to remake this one. 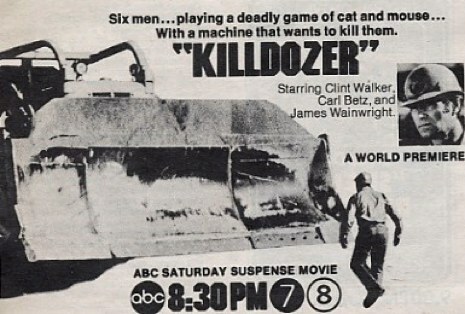 Marvel rolled-out its own adaptation of the novella at the beginning of '74, presumably tipped-off that the TV movie was in production. 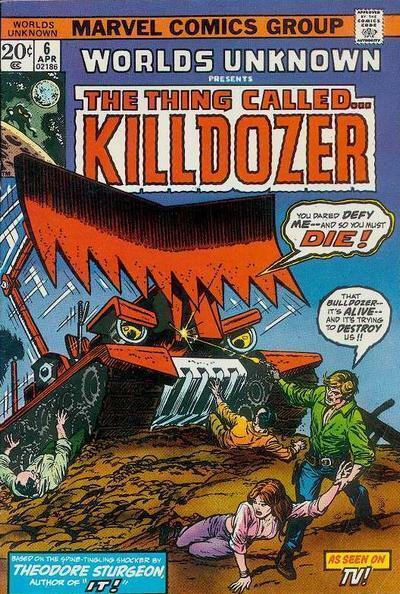 Marvel's adaptation of the Sturgeon book, published several months before the broadcast of the tele-flick.